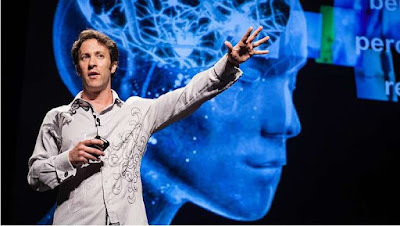 David Eagleman on the brain, BBC 4 TV. Remarkable (to me, at least) stuff about the way the brain perceives the world around it. If this interests you, please bear with it; it's a bit lengthy, but I'm going to try to relate it to thoughts about the self, and about the present moment. Sprinters need 1/10th of a second for their brains to process the sound of the start gun. This can't be improved on, however much you train. You can become faster at getting off the blocks, but you will always be 1/10th behind the actual sound of the gun when you start moving. And if you use a visual signal, say, a light coming on, the gap is longer, because visual processing takes longer, is more complex. So the brain needs time to make anything happen in the body, and it "hides" this delay, it doen't show its workings. We think our response is simultaneous. It isn't. So in a sense, we are living in the immediate past. We can't perceive the immediate present moment - it's gone before we can process it, so we act retrospectively. I think somehow, we maybe know this, or sense it, which is perhaps why the present seems so intangible compared with the past- memories, and the future - plans, hopes and fears. I'll move on to sight. The eye takes in signals and sends them to the brain, and that is where we actually see things. Signals go to a bit of the brain called the thalamus for processing before going to the visual cortex, where vision takes place. But signals go back and forth between eye and thalamus, as the brain takes in visual signals, compares it with what it's already got, issues instructions to the eye (something like"look top left corner, tell me...") and then when it's done (lightning speed, of course) it sends the final version up to the visual cortex, which is when we see what's before us. But we never take in with the eye exactly what is in front of us, all of it, because the brain works on a "need to know" basis. This is quite easily tested; try looking at a picture with a narrative or descriptive title, which will arouse expectations. Constable's "The Hay Wain," for example. Look away, and then have someone ask you what the picture's about, and you'll probably say "a hay cart in the middle of a river." Then get the second observer to ask you something irrelevant to the title, such as "how many chimneys does the cottage on the left have?" You probably won't know, unless you know the painting very well already. This isn't, or isn't only, about the memory, it's about how we see. If you were asked first off about the chimneys you'd get it right, because that's what you'd look for - but you mightn't know how many horses were pulling the cart. So you're using your eyes as collectors of sensory data, on a need-to-know basis, and adding and amending the sensory data accordingly. We are seeing with our eyes what the brain, to some degree, is telling us to see. What this means is that our vision is always partial, always selective. And so my visual idea of the world around me will be different from someone else's, because they will have been looking for and logging different things. This data adjustment happens all the time, constantly, and very fast. But it still leaves us with a profound truth: our perception of reality is transient, dynamic and unique to each of us. As Eagleman puts it, the brain is the universe's great storyteller, creating realities inside our heads, and my brain provides its own unique model of the universe around us. There was a lot more to this fascinating programme, and it was only the first part of a series, but it supports some ancient insights: our sense of reality is partial, and it changes. It isn't fixed, not for you or me, however much it feels like it. And - the present is over before we know it, yet the present is the only place we can be. Memories happen in the present. Hopes for the future happen - in the present. The paradoxes of the present moment, if taken right in, can free us from illusions of permanence, can help us live not just with, but as, change. And all is always now." 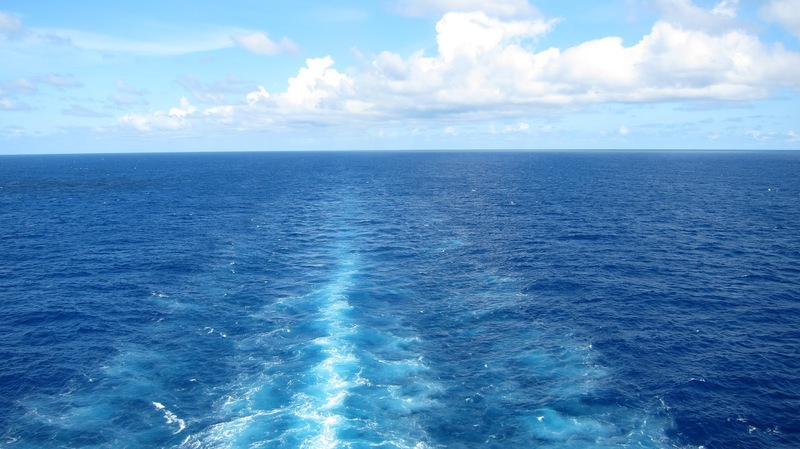 Receding, or those who will disembark." To wake up to reality, we need to live with the understanding that reality is provisional, partial, ever-changing; and we are part of that ever-changing reality. Given this as demonstrably true, how can the self, yours and mine, be anything but a changing construct? Back in the world of neuroscience, Eagleman looks out over a city and says "where abouts is the economy of this city?" No place. It is a huge set of interactions, of relationships, always changing. Where is my self? There is no place in the brain where you can find it. It's a lightning-fast collection of mental interactions, within me and between me and the outside world. I am change. I am processes, not a thing. The illusion of a permanent self might be socially useful. The illusion of a fixed reality out there in front of us, ditto. Just so long as we don't mistake it for ultimate reality, not knowable by the reaasoning intellect. "Not farewell, but fare forward, voyagers." Into the paradoxes. A poet takes tea on January 1st.